A pulse oximeter is a noninvasive prescription medical device used for measuring a patient’s oxygen level in the blood and pulse rate. These are important vital signs to provide feedback on a patient’s health status. 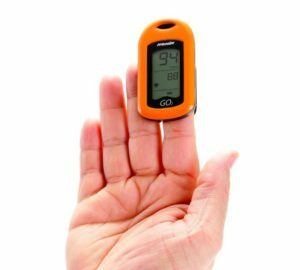 A portable pulse oximeter is a small device, usually made of plastic and battery operated, that clamps comfortably on to a fingertip. It has an easily readable display window on the front which reads your pulse and oxygen-saturation levels within seconds. They can be easily carried with you wherever you go. Normal oxygen saturation levels are between 95 and 100 percent. Anything below 90 percent is considered a clinical emergency. Pulse oximeters are used by Adults and children suffering from chronic illnesses such as congestive heart failure, anemia, lung cancer, heart attacks, respiratory conditions like COPD, Asthma and Sleep apnea. Pulse oximeters are progressively being used by fitness centers and gyms by individuals and athletes monitoring their endurance, speed and efficiency. By maintaining an effective oxygen range, they are able to advance their overall performance. People performing high altitude sports such as mountain climbing, skydiving and hand gliding keep a pulse oximeter as an essential item in their kit. Over the years as the population ages, we have increasingly seen the use of the Pulse Oximeter due to rise in respiratory and cardiac diseases. Those on long term oxygen therapy as well as people with the conditions listed above, can actively manage their daily conditions through self-monitoring using the pulse oximeter. Home pulse oximeter monitoring helps caregivers and doctors know if the person in their care is achieving their therapeutic goals at home. Home pulse oximeters will play an important role in remote clinical decision making and improve patient outcomes as the population continues to age and require to live independently. Self-monitoring and spot-checking from home can save time, anxiety and doctors’ visits, and, in general, helps patients with respiratory disease live an active and independent lifestyle. Although the noninvasive nature of pulse oximetry has added value in the homecare setting, it is not a substitute for medical care and management. It will also not replace arterial blood gas analysis, particularly in emergency situations. Nor will it replace your own personal assessment of how you are feeling. As with any medical device, always discuss with your doctor for proper use and further instructions.